All of the alpaca color phenotypes pictured below are variants of the Harlequin Appaloosa gene. At present, it appears that any variation of the gene can produce any other variation when bred correctly. In other words, it appears that all of the various types of Appaloosas and Harlequins result from the actions of other color genes modifying the expression of the Harlequin Appaloosa gene (see Genetics Section for more information on this). Due to the inherent extreme variation that characterizes Harlequin Appaloosa alpacas -- that makes them so very much fun! -- they clearly do not all fit into neat boxes. However, we believe that the below variations may represent distinct genetic categories, with the variation arising from the actions of other genes. We feel it is important to catalog the various phenotypes of Harlequin Appaloosa, as this may serve as a reference for breeders wondering whether their alpaca's unique appearance is a result of the Harlequin Appaloosa gene -- or simply a fluke. True Appaloosa alpacas have either a uniform distribution of spots throughout the body, or spots that are concentrated primarily on the ventral neck and lower legs. The base coat may be as light as off-white, but it is never bright white as is seen on pinto and blue-eyed white alpacas. The spots may be as dark as deep maroon, but no darker. 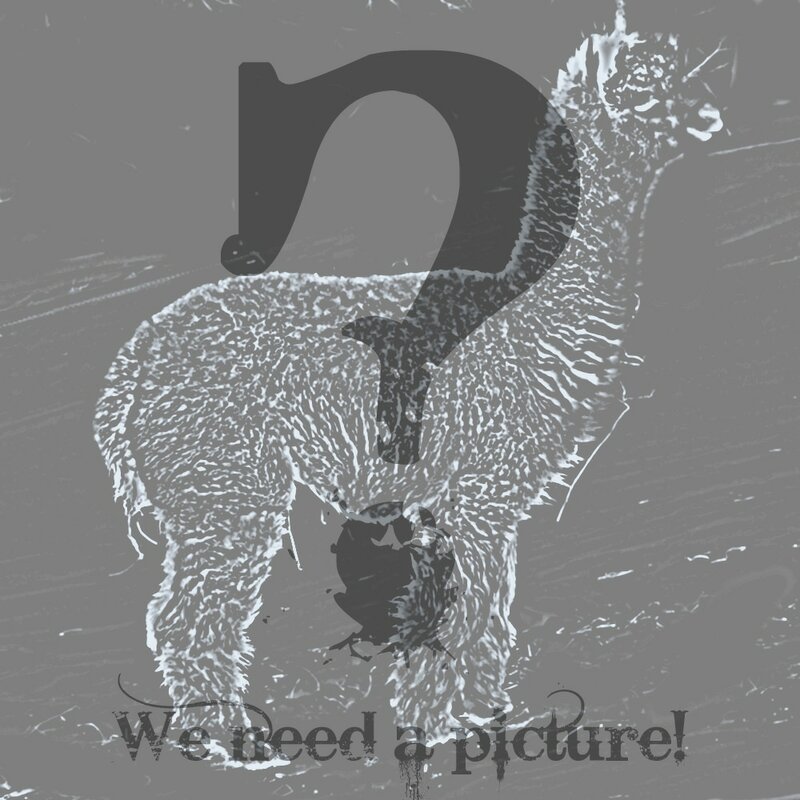 There is no true black present on the animal, as these alpacas are base chestnut (see Genetics Section). Minimally Expressed -- Light beige with beige or light fawn spots. 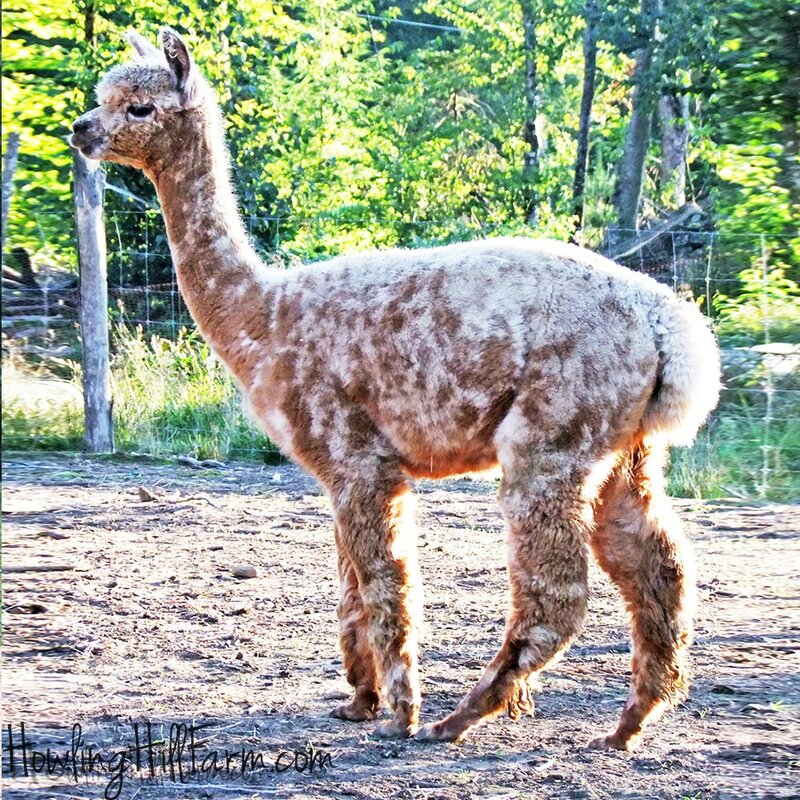 The color of the spots and the base coat are so close that the spots may only be visible when the alpaca is shorn. Few to no spots on the face. Processed fleece ranges from beige to light fawn. ﻿Classic Beige Appaloosa﻿ - Light beige base coat with distinct fawn or light brown spots that are concentrated on the neck and limbs and extend uniformly throughout the blanket. Few to no spots on the face. Processed fleece ranges from light fawn to light rose grey. Classic Fawn Appaloosa - Beige to light fawn base coat at the tips with silvering closer to the skin. The spots are especially concentrated at the neck, and uniformly distributed throughout the blanket. Lots of spots all over the face. Processed fleece ranges from light rose to light silver grey. Reverse Appaloosa -- Very rare form of appaloosa in which the base coat is a medium fawn to maroon with lighter spots that are concentrated over the back. The spots may range in color from white to medium silver grey, and appear to darken as the animal ages. From a genetic perspective, the lighter "spots" most likely represent the actual base coat, while the darker "base coat" is most likely one very large spot. Processed fleece will be varying shades of rose grey. Leopard / Giraffe Appaloosa -- Beige to fawn base coat with dark fawn to maroon spots. The spots are very large and concentrated on the neck, with extensive distribution throughout the blanket. Processed fleece will typically be medium rose grey. 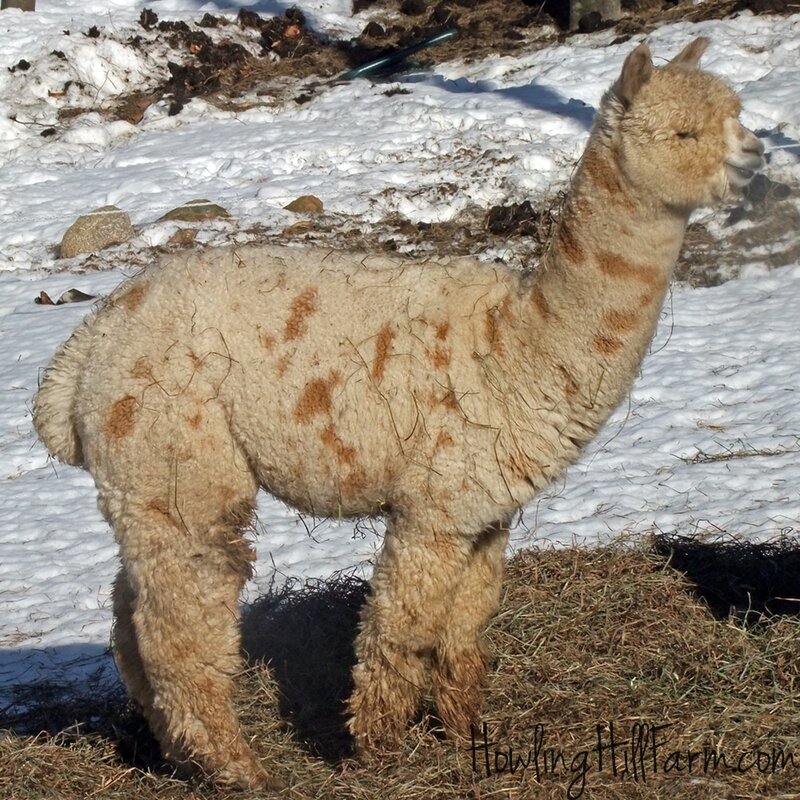 Harlequin alpacas are characterized by their tendency to change colors between shearings. They often start life fawn or light brown and shear out grey, and typically grow darker through their first few shearings. Because they produce a grey fleece, they are also often referred to as Harlequin Grey. If they have spots, the spots will be black. These alpacas are base-black (see Genetics Section). Classic Harlequin -- These alpacas begin life as solid light fawn to medium brown cria, and shear out as light to dark silver or rose grey. They may or may not have dark brown to black spots on the blanket, but most will have black spots on the face and belly. Classic Harlequins typically darken as they age. Processed fleece ranges from medium to dark rose or silver grey. Merle Harlequin -- What characterizes this variety of Harlequin is that, unlike most Harlequins, which change color, these are born dark grey. The variety of colors extends throughout the blanket, often giving a Merle or marbled appearance. Processed fleece is typically dark rose grey. 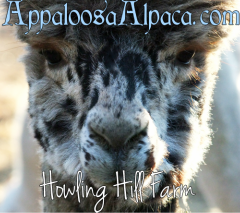 Platinum Harlequin -- One of the rarest alpaca colors, and our personal favorite at Howling Hill farm. The Platinum Harlequin begins life as a light fawn, and shears out to a light silver or rose grey. Spotting, if present, is minimal (1-2 spots) and confined to the face and legs only (often in the form of a "mustache" above the lips). Platinum Harlequins appear to be intimately associated with the Classic Tuxedo Grey phenotype; the vast majority have a Tuxedo Grey parent. Between this and their lack of spots, they are very often mistaken for Tuxedo Grey. Processed fleece ranges from light to medium silver or rose grey. Wild-Card Harlequins -- All Harlequin and Appaloosa alpacas are unique, but some are truly one-of-a-kind. These unique Harlequin alpacas often appear to result from a concomitant expression of two different pattern genes (for example, Harlequin and Pinto). Typically, these other pattern genes appear to mask the expression of Harlequin, but on the rare occasions that, for what ever reason, they do not, amazing things can result. Photo copyright Illini Alpacas (thank you, Tammy!). The following alpacas are not True Appaloosa or Harlequins. They may be mistaken for such by the untrained eye. There is nothing wrong with the alpacas pictured below, and they all may have their place in a breeding program, but, for our purposes, it is important to appreciate that they are not likely to produce Harlequins unless they also carry the Harlequin gene. Speckled Pinto -- This is the most common Appaloosa mimic. By AOA show standards, these alpacas are considered appaloosas. 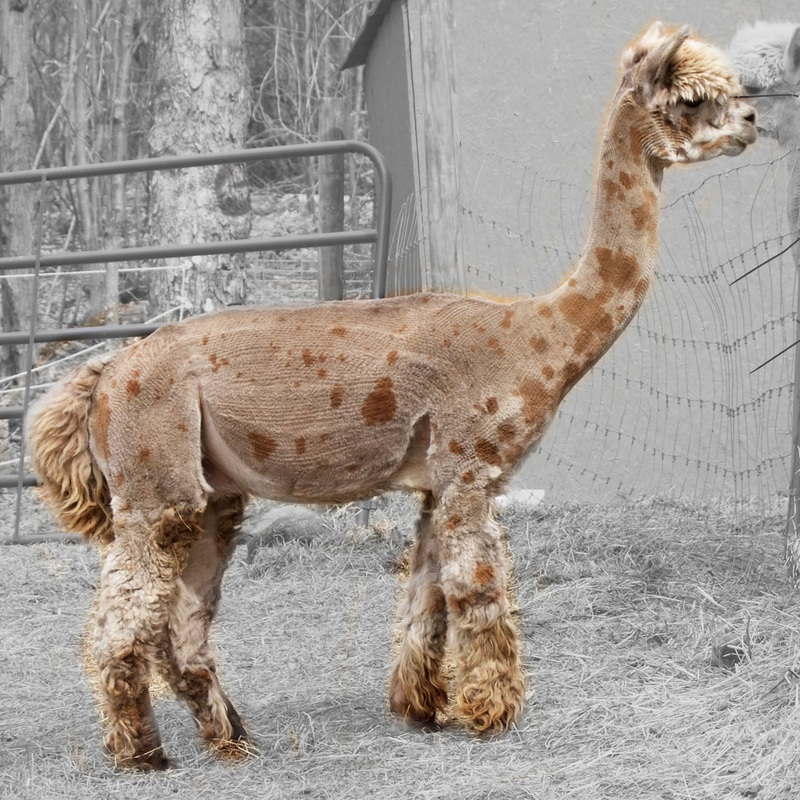 However, this phenotype does not appear to be a result of the Harlequin Appaloosa gene, and these alpacas will not produce Harlequins -- unless they have a Harlequin in their ancestry, and inherited the gene from that ancestor. Speckled Pintos have a bright white base coat and spots that range in color from light brown to black. As with Reverse Appaloosas, it is most likely that what appears to be the dark "spots" actually represents the true base color, and that the white portion is actually one really big genetic white spot. They can be easily distinguished from true Appaloosas by the distribution of spots. The spots of a Speckled Pinto are primarily concentrated on the blanket, and rarely extend to the belly or to the ventral portion of the neck. The spots of a Speckled Pinto are also typically smaller than those of a true Appaloosa. The muzzle and feet are typically colored (the same color as the spots). To make matters more confusing, the Speckled Pinto phenotype typically masks the expression of Harlequin -- in other words, if an alpaca carries both genes, it will appear to be a Speckled Pinto. Because early appaloosa alpaca breeders did not realize that these animals were genetically distinct from the true Appaloosas, they were often bred together in the beginning. 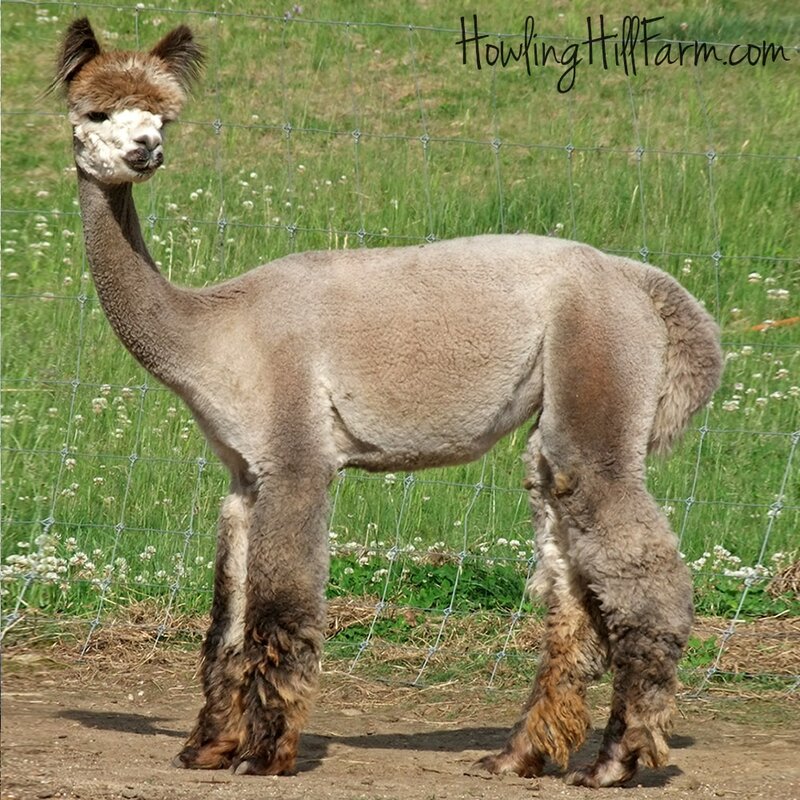 Because of this, Speckled Pintos may produce Harlequins with a slightly higher frequency than other alpacas. However, this is because they are slightly more likely to carry the Harlequin gene, not because the Speckled Pinto gene itself can produce Harlequin. Because it masks the expression of true Appaloosa, most appaloosa breeders now avoid this alpaca phenotype. Spotted Fawn -- These are substantially more rare than the Speckled Pinto, so much so that we're really not entirely clear what they actually are from a genetic perspective. 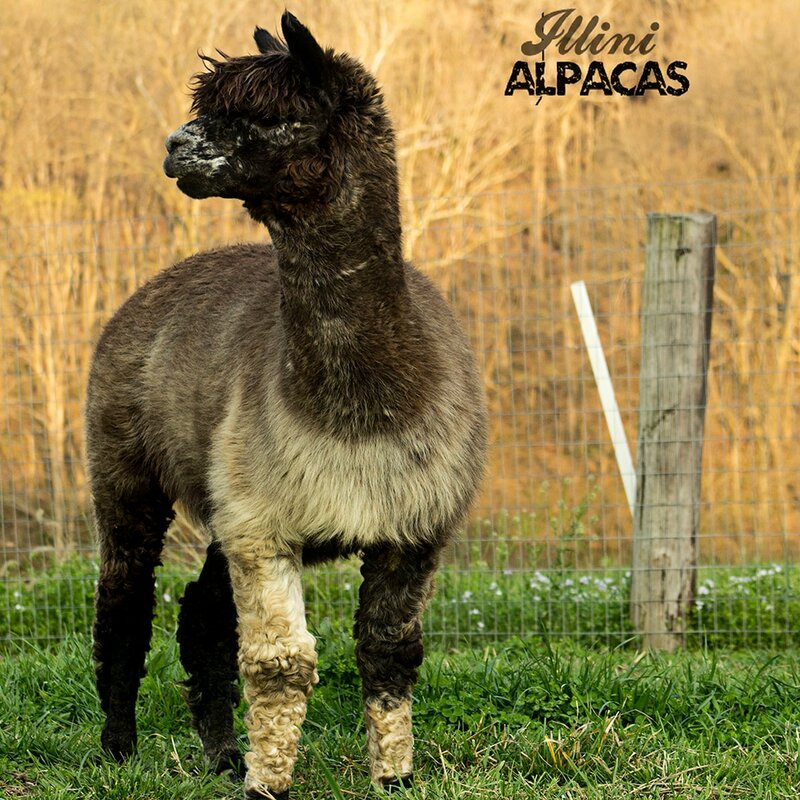 These alpacas have a medium fawn base coat with dark fawn to brown spots. The spots are large and irregular, and distributed evenly throughout the blanket. This phenotype does not appear to be associated with Harlequin Appaloosas, though time may prove us wrong. Spotted Classic Tuxedo Grey -- Classic Tuxedo Grey alpacas often have spots. Some have so many spots that they may be mistaken for appaloosas! However, the spotting on Tuxedo Grey alpacas does not appear to be at all related to the Harlequin Appaloosa gene. In fact, those alpacas who carry both genes are generally very uniform in color. Modern Rose Grey -- Some minimally-spotted Harlequins can be difficult to distinguish from the "roan-type" Modern Rose Grey. Indeed, the Modern Grey phenotype appears to be closely associated with the Harlequin genotype, and there are a few Modern Greys out there that do carry Harlequin. However, without going through the distinct color change that characterizes a Harlequin, Modern Greys cannot be categorized as Harlequins. Wild Cards -- Every once in awhile, an alpaca pops out into the world whose wild, unique coloring just doesn't fit in any clearly defined category. 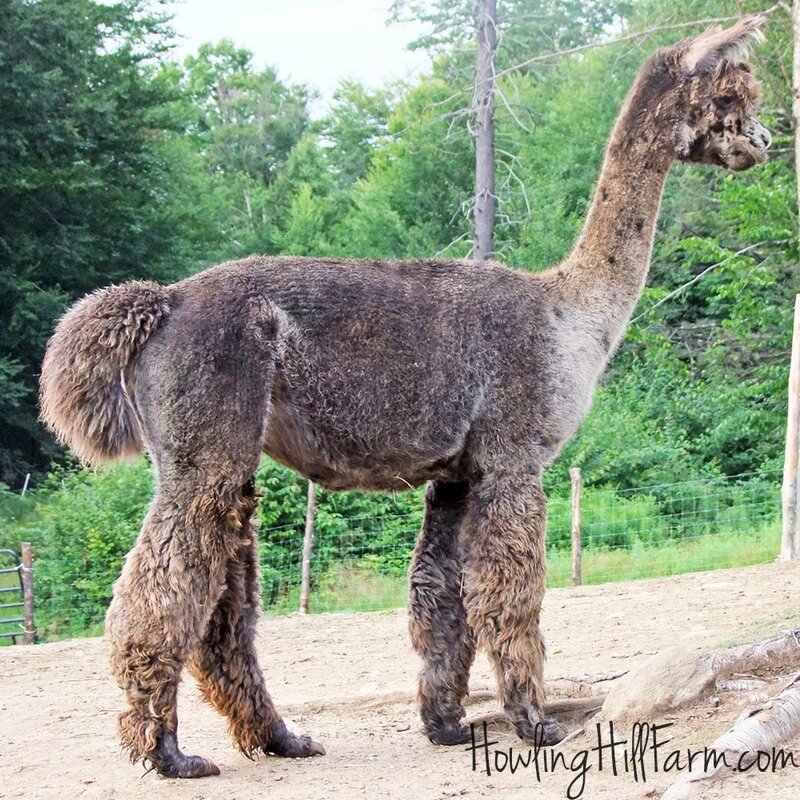 We love these alpacas at Howling Hill Farm, whatever they may be, but given that we are genetics geeks, we try to make sure we know what they are. By and large, the Harlequin gene appears to be masked by most other pattern genes -- in other words, an alpaca that carries the gene for another pattern (pinto or tuxedo grey) as well as the Harlequin gene will typically express the other gene, with no sign that it carries Harlequin. Over time, however, we have become aware of a few alpacas that appear to carry and express both genes. These are very rare, and it is unclear why the majority of alpacas with two pattern genes do not express Harlequin, while a few do. Even more intriguing is the fact that those that do express Harlequin alongside another gene appear to be capable of reproducing this trait. There is clearly a lot more to learn about the inheritance of this gene! Pinto Harlequins -- Typically, the pinto gene masks the expression of Harlequin Appaloosa ... But sometimes it doesn't. When it doesn't, the alpaca often looks like a Harlequin or Appaloosa, with patches of white. The white patches are true (bright) white, and do not change color with age, unlike the rest of the alpaca. These are incredibly rare, but there are at least three separate bloodlines that we are aware of that display this trait. Taupe Tuxedos -- While the tuxedo grey gene typically masks the expression of Harlequin completely, some animals with both genes are a little more ambiguous. The coloring of these animals is a rosy taupe that is typically associated with the Harlequin gene, and it can sometimes even be difficult to distinguish these "crossover" animals from a solid Harlequin.